Cabinet Room: Perfect for small business meetings or classes. 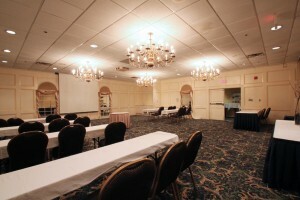 State & Embassy Room: Two elegant rooms that can be used singularly or combined for maximum capacity. Each room offers convenient parking, a private entrance and handicap accessibility. Oak Room: Works well for intimate dining, receptions or small meetings. Also can be used as an auxiliary meet-and-greet reception area for guests in the State & Embassy Rooms. Boardroom: This large room works especially well for business functions such as meetings & seminars. Please call us directly at 1-877-772-2224 or email our Sales Director, Stacy Barnes at [email protected] for additional information about our meeting, event and/or banquet facilities.